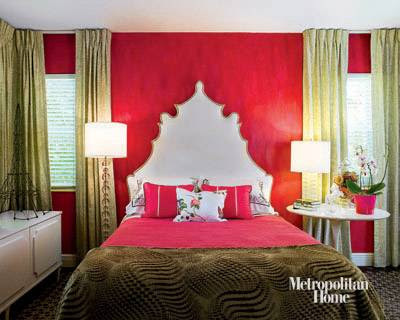 You must check out this months Metropolitan Home, the spread of Nisi Barryman's South Beach home is out of this world. Nisi is the founder of NIBA Home, a showroom which is filled with amazing things from top to bottom. These are the types of websites and magazine spreads that make me wish I was a millionaire, better yet had a few different homes I could furnish. How could you not want to see more with that HOT pink front door- it just welcomes you from the start. 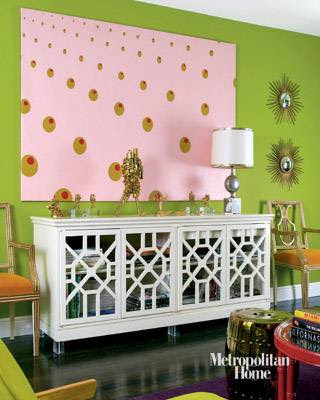 LOVE this sideboard/cabinet with the Lucite feet. 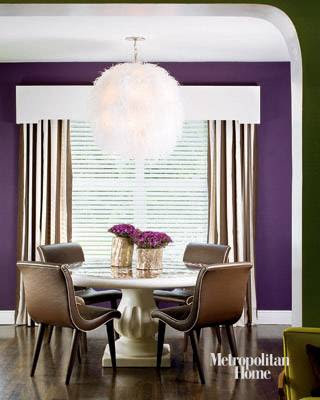 The two side chairs that are on either side are great too, and the color is my fav! I spy my favorite color! I love that orange side chair, and the pattern on the rug is wonderful. This headboard is awesome! I love the shape of it, and how it pops right off those hot pink walls. 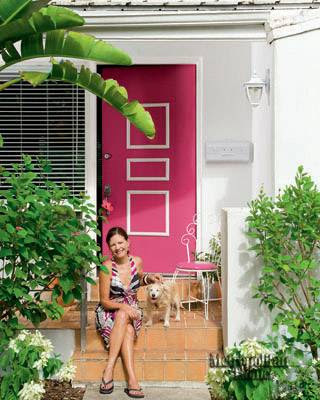 I love that pink door. I ideally wanted to paint my front door that color, but the hubs got in the way and said he wasn't going to live in a doll house so we both agreed on black. I know that green is a bit loud, but I love it. I actually painted my bedroom in my parents house that color at one point. It made me so happy and made me feel like I was on vacation. It was just one of my many re-dos. I love those orange chairs as well. Orange is one of my favorite colors. I use lots of touches of it in my living room. I'm in the works of picking out someone to come and take pics of my house for my new business. So they are coming! L: thank you for the birthday wishes!! I had a great day. Yee gads did I miss this issue? I better go home and check. 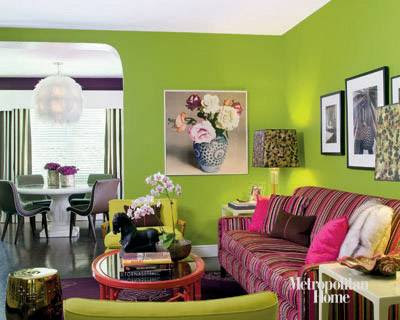 I LOVE Her home and all the colors!! !